Congratulations on a lovely and charming apartment! Your apartment is fantastic. So clean and chic. Isn't it awesome living in the big city? Omg! the place is beautiful! Just found your blog! Lovely pictures, your apartment looks amazing. wow!!! you look soo pretty! I love your hair! So happy for you! Looks absolutely lovely! It seems so adorable! You are a lucky girl! I could only dream of having an apartment in NYC. lovely, boho chic. Just how i like it!! im a fan!! Wonderful photos!! Looks like an amazing place. (: I love the decor. I love the decor, and I love your new hair cut! you look so lovely, I love the colors :) amazing photos, I also love the decor!! You have just moved in and the apartment looks so adorable already! Last photo is so sweet! You look mega beautiful in this post! Qué blog mas romantico, me gusta por eso desde ya te sigo. Your apartment is so pretty, I wished I live there! You look so sweet too in that blouse. Great apartment. Love the cute little touches everywhere. the apartment looks gorgeous! there's nothing more fun than a room makeover! it looks great! you've settled in so well already! i love how you display your jewelry....so easy to see it all. i really have to work on this myself. i wish i could see more of my jewelry. and, i spy murakami on your table. kafka on the shore is one of my favorite books ever! i teach it for my senior english class! This is beautiful! Congratulations on your apartment, hope you are enjoying it! You ladies have excellent taste. That blouse is absolutely darling! I'm loving your blog girl, so glad I stumbled across it! 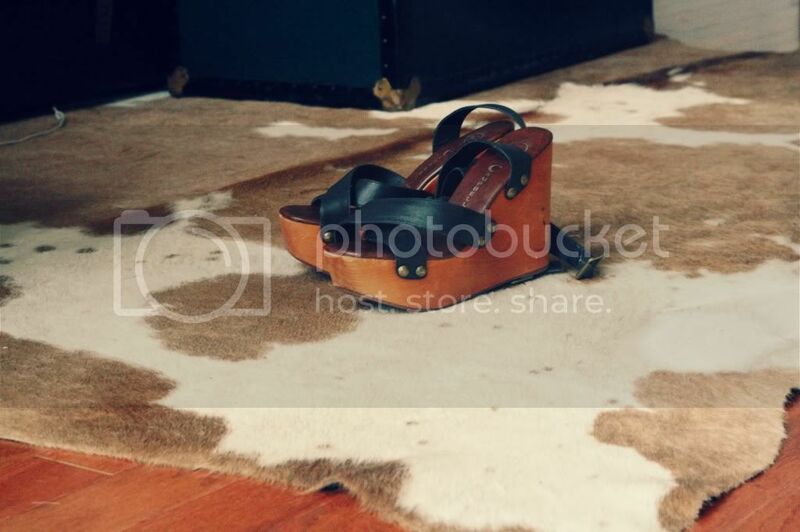 love your accessory hanger and your shoes!! It looks really cute. Love your outfit! Bonnie, you are seriously THE absolute prettiest! And it looks as if your apartment is shaping up to be the same. I love your romantic blouse paired with that pleated skirt. What a lovely home, and I think it is a great representation of you and your style darling, it definitly looks to have a homely feel. I love the dining area. So nice it already feels like home. I have that same necklace! lovely vintage apartment <3 !! All of these photos are really cute! you look like a princess! 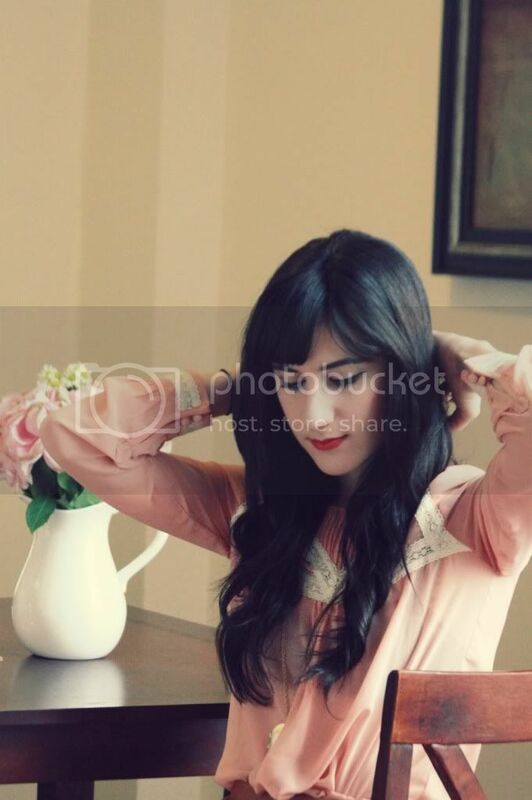 You have such a pretty blouse :) I'm glad you like your new apartment, the cute little cat cup is my fave! oooohhh, you are so so so so lovely!!! you look so lovely. incredible and sweet apartment. 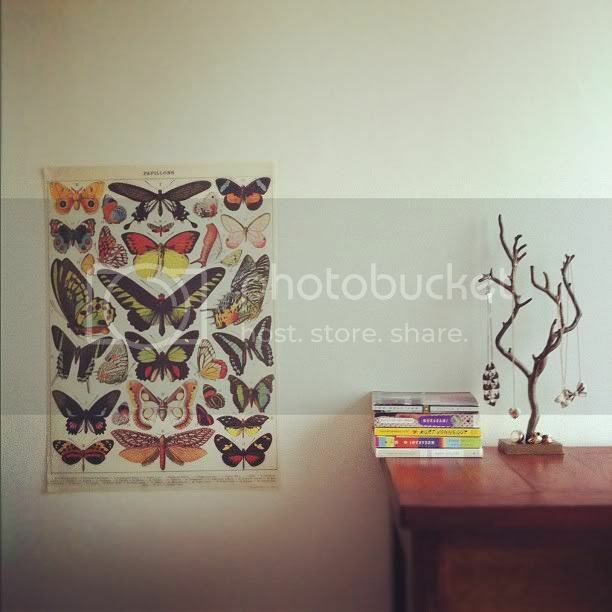 Your butterfly-poster is so cute and love the necklace rack too. sooo exciting! It looks absolutely adorable!!! From what I can see it looks like you and your roomies are very neat. I like the lace trimmed blouse, the pleated skirt and the nice contrast with that pretty red lipstick and the blue tights. Glad it's feeling like home with Christina and Selena in that nice apartment. Beautiful little place you got there! i love the whole vintage vibe your apartment has. the shoes in the third picture down are to die for I love them. Also, lovely outfit...that top is beautiful! 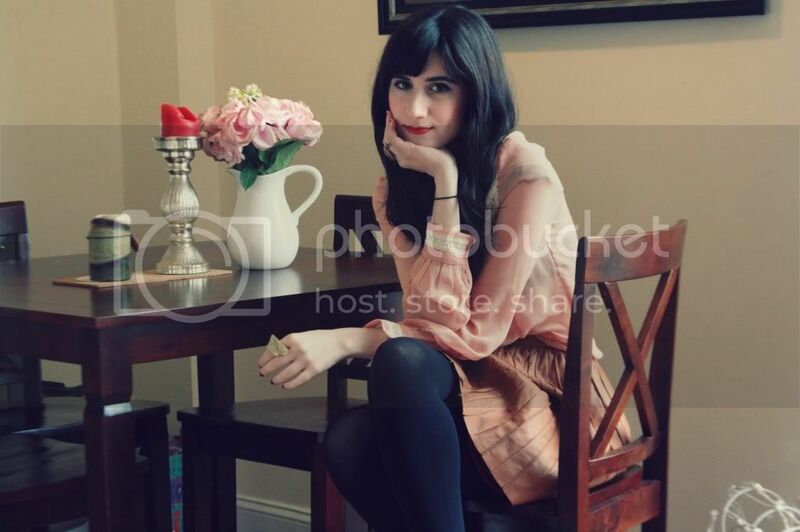 Aw, your cat mug is the cutest ever <3 and I love love love how your jewellery is displayed! Cute vintage stuffs!! OMG i like the colors you match between that peachy pink and the poodle brown. 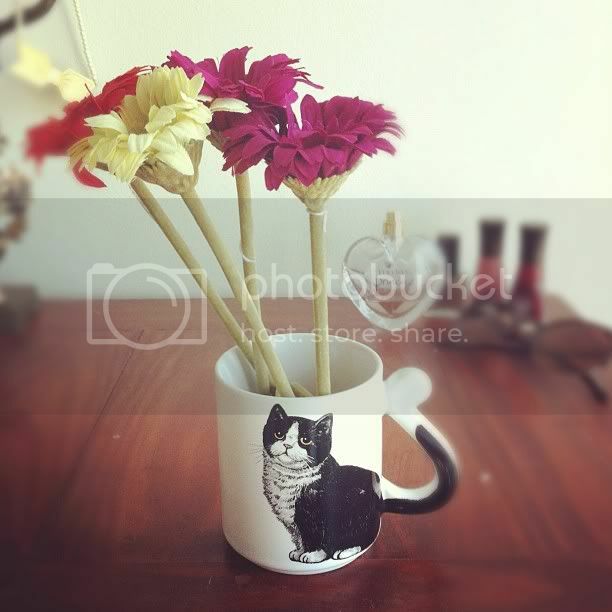 Love that cat mug and your apartment is so cute from what I see! I love your vintage-inspired dress, a staple for a spring season. If you want day dresses, I suggest you check this out http://www.missesdressy.com/day_dresses.html. By the way, you have such a good looking face, which suits any dresses. If you don't know what features are available in your area, try exploring the websites of online apartment locator services. You can search for apartments based simply on whether you want a one- or two-bedroom apartment or by other features. It's a great way to find out both what your pad will cost and what neighborhoods have the features you want. Mm, it's looking good! If that's a work in progress, then no doubt the finished product would be excellent. The colors are quite lovely, in any case. It helps set a soft and peaceful image in your apartment. A treasure hunt is a fun and intellectual game for children. And it would be more exciting if you add more flavor to it by using pirate costumes and props! The key to playing Treasure Hunt is to always follow directions; children will be able to apply that to everything else they do when they grow older. Your apartment is beautiful, just like you. :) And those flowers make the whole place look very fine and exquisite. Plus, that soft rug is quite a sight too. The feminine and stylish design of your apartment reflects your fashionable taste! A gorgeous lady like you deserves to live in a charming place like this. 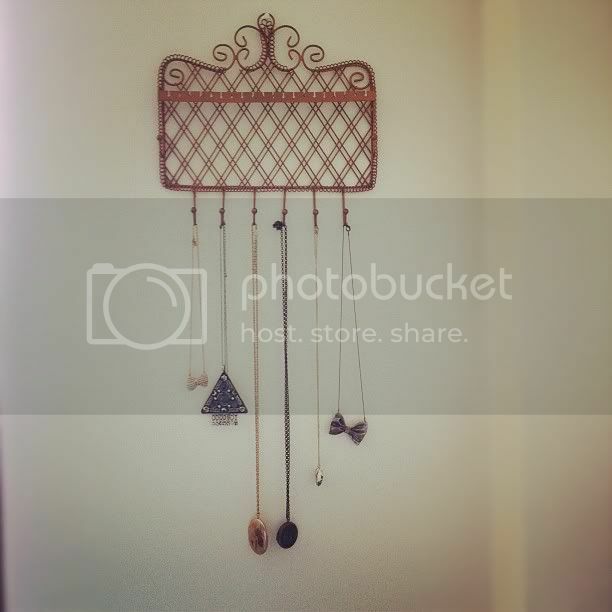 I particularly like that table piece you have in the second photo, the one where you hang your pendants and necklaces. It’s definitely an eye-catching piece.